Sony has produced another good camera in the shape of the a3000. It's not hugely exciting, but it's not meant to be. It produces excellent image quality and is available at an enticingly low price point. Sony was one of the first manufacturers to bring a compact system camera to the market, with the original Sony NEX-5 and Sony NEX-3 back in 2010. Since then, we've seen plenty of iterations of the camera, all keeping pretty much the same type of design - that is, fairly flat and compact styled. In the same period of time, Sony has also launched its DSLT range, which are akin to DSLRs in design, size and shape, but with a fixed, translucent mirror. And now, in what some may see as a slightly odd move, the Sony Alpha a3000 combines the two systems. It's got the styling and size of an Alpha DSLT, but uses the E-mount and mirrorless design of the NEX range. Sony explains that when consumers enter a store to purchase an interchangeable lens camera, they're not necessarily looking for a traditional DSLR/DSLT, but there are many people who crave the large form factor that these 'serious' cameras bring. Sony is not the only company to offer DSLR-shaped compact system cameras. For instance, the Panasonic G6 and those G-series models that came before it also feature a traditional type shape. The same can be said of the Samsung NX11. Despite the fact that the E-mount is found on the Alpha 3000, Sony has decided to omit the NEX name from the camera, which could perhaps be a little confusing. In effect, Sony now has three lines, the standard Alphas, the standard NEX cameras, and the Alpha E-Mount camera. Sony has also recently introduced the Sony A7 and A7R, two full frame mirrorless cameras. Along with this announcement, it was revealed the company will be dropping the NEX brand from its cameras in future, they will all simply be Sony Alpha. Some will be Sony Alpha E mount, while others will be A mount. Whether this will create confusion for consumers remains to be seen. Inside the A3000 is a 20.1 million pixel APS-C sized sensor. Sony says that this is a new sensor, and it's joined by a Bionz processor, while the camera comes with an 18-55mm f/3.5-5.6 lens as standard. On the back of the camera is a three inch, 230,400 dot LCD screen. It's neither touch sensitive or tilting or articulating. There is however, an electronic viewfinder, which is a 0.2 inch device. 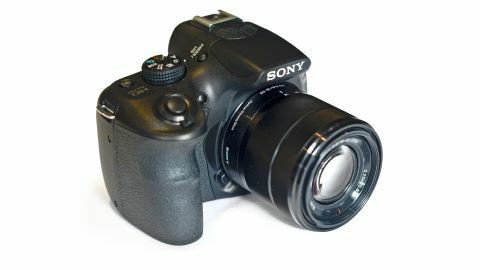 As with Sony's other Alpha cameras, it is capable of shooting in raw format and allows full manual control, as well as providing semi-automatic exposure options. It's one of the more basic cameras in Sony's range, therefore it doesn't offer Wi-Fi or NFC connectivity like the NEX 5T. Of course there are already several cameras with this form factor in the shape of the Alpha DSLT range, but Sony says that using the E-mount has several benefits for consumers. Sony's major claim for this camera is that the AF speed and accuracy surpasses Canon or Nikon's DSLRs. In terms of competitors, the a3000 goes up against the likes of the Panasonic GF6, Olympus PEN E-PM2 and the Samsung NX-11. It's very good value though, coming in at under £280 / $350 for the camera and kit, making it significantly cheaper than the majority of its direct competitors. It arguably also competes with Sony's own NEX-3N, which features a similar specification set but with a flatter, more compact style design.